I know I haven't written in a while - my workload has picked up significantly, so I've been spending a good amount of time in the library. 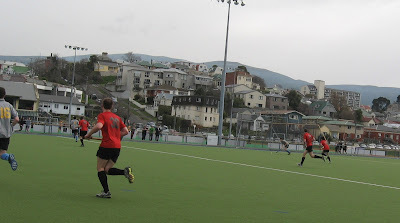 This past weekend I did get a chance to watch my friend Jono's field hockey final. (Here, when you say "hockey," people assume you mean "field hockey." You'd have to specify "ice hockey" if you want to talk about that. And yes, men play field hockey here!) Unfortunately his team lost, but they put up in a good effort to finish with a score of 5-2. As you may remember, I've been taking kickboxing classes twice a week here. One of my instructors told us about a fight night on Saturday, and I was keen to see some actual action now that I've learned some of the moves myself. So I went to the MMA / Muay Thai tournament! It was an interesting crowd - lots of burly, bearded men with young, tattooed, short-skirted women. (And then me...) It was an entertaining night for sure! There were 12 bouts - 11 amateur fights and 1 professional bout to finish off the night. My instructor fought, but unfortunately lost by TKO in the second round. He put up quite a fight, though; I was very impressed. All in all, I got to see some nice punches, a few bloody noses, and the eclectic South Dunedin crowd. It certainly was an unusual night for me!